The weather seems to be slowly improving and hints of a pleasant Spring are on their way. As such the supermarket freezer section seems to have taken on several new products in anticipation, but don’t worry I’ve stocked up. Coffee and chocolate is one of my favourite combinations so obviously these new Magnums were the first to be cracked open. 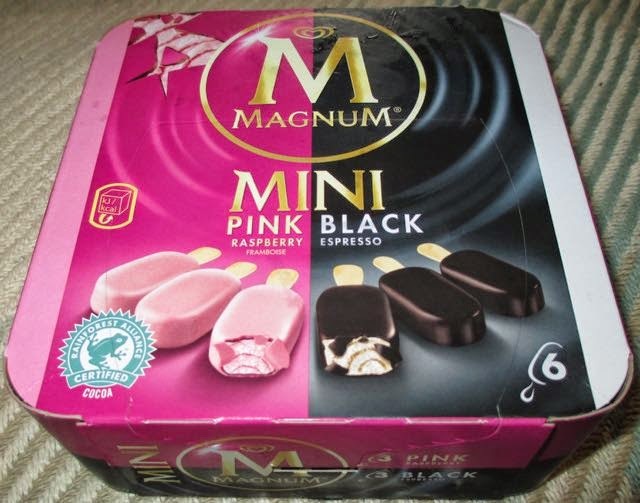 The box is actually a duo, Magnum Mini Pink Raspberry and Magnum Mini Black Espresso. There are three of each of the two flavours, and they are a smaller size to the regular ones, so perfect for a little treat. The pink ones and black ones are distinguishable from their colour coordinated wrappers. Under the black wrapper was a very dark looking lolly, the coating was near black. It cracked easily when I bit in, and revealed a vanilla ice cream marbled with a rich coffee sauce. I loved the flavour of the chocolate coating, it was strong and with a really good strong cocoa flavour. 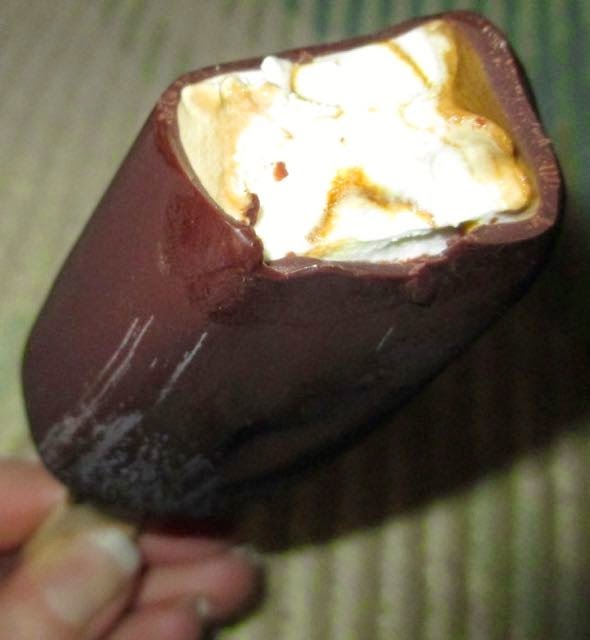 The intensity of the strong flavours, was spot on, the coffee sauce provided a rich kick of arabica coffee that enhanced the chocolate, and the creamy vanilla ice cream softened the Magnum’s overall flavour. I think the creamy ice cream made this Magnum a bit more of Latte, well Mocha actually with the chocolate, rather than an Espresso, but I still enjoyed every mouthful. This could well be my ice-cream of choice for a while, I wish there were more products with coffee and chocolate combinations available,this dark flavours work so well together. I’ll be reviewing the Pink Raspberry Mini Magnum very soon, not forgetting the other new exciting ice creams I picked up, so watch this space.